Not to be confused with Armenians or Romanians. The Aromanians (Aromanian: Rrãmãnj, Armãnj) are a Romance ethnic group native to the Balkans, traditionally living in northern and central Greece, central and southern Albania, North Macedonia, south-western Bulgaria and Kosovo. The term Vlachs is used in Greece to refer to Aromanians, but this term is internationally used to encompass all Romance-speaking peoples of the Balkans and Tatra Mountains regions. Aromanians speak the Aromanian language, a Latin-derived vernacular similar to Romanian, and has many slightly varying dialects of its own. It descends from the Vulgar Latin spoken by the Paleo-Balkan peoples subsequent to their Romanization. Aromanian is a mix of domestic and Latin language with additional influences from other surrounding languages of the Balkans, mainly Greek, Albanian, Macedonian and Bulgarian. The term Aromanian derives directly from the Latin Romanus, meaning Roman citizen. The initial a- is a regular epenthetic vowel, occurring when certain consonant clusters are formed, and it is not, as folk etymology sometimes has it, related to the negative or privative a- of Greek (also occurring in Latin words of Greek origin). The term was coined by Gustav Weigand in his 1894 work Die Aromunen. The first book to which many scholars have referred to as the most valuable to translate their ethnic name is a grammar printed in 1813 in Austria by Michael Boiagi. The Greek title was Grammatike Romanike Etoi Makedono-Blachike (Roman or Macedono-Vlach Grammar). The terms Aromanian or Vlach are both exonyms; the first one is modern, the second medieval. The Aromanians call themselves Rrãmãn or Armãn, depending on which of the two dialectal groups they belong, and identify as part of the Fara Armãneascã ("Aromanian tribe") or the Populu Armãnescu ("Aromanian people"). The endonym is rendered in Romanian as Aromâni, in Greek as Armanoi (Αρμάνοι), in Albanian as Arumunët, in Bulgarian as Arumani (Арумъни), in Macedonian as Aromanci (Ароманци), in Serbo-Croatian as Armani and Aromuni. The term "Vlach" was used in medieval Balkans as an exonym for all the Romance-speaking (Romanized) people of the region, as well as a general name for shepherds, but nowadays is commonly used for the Aromanians and Meglenites, Daco-Romanians being named Vlachs only in Serbia and Bulgaria. The term is noted in the following languages: Greek "Vlachoi" (Βλάχοι), Albanian "Vllah", Bulgarian and Serbian "Vlasi" (Bласи), Turkish "Ulahlar", Hungarian "Oláh". It is noteworthy that the term Vlach also meant "bandit" or "rebel" in Ottoman historiography, and that the term was also used as an exonym for mainly Orthodox Christians in Ottoman-ruled western Balkans (mainly denoting Serbs), as well as by the Venetians for the immigrant Slavophone population of the Dalmatian hinterland (also mainly denoting Serbs). Kahl divides the Aromanians into two main groups, the "Rrãmãnj" (Romanian: Aromâni Fărșeroți, Greek: Arvanitóvlachi) and "Armãnj" (Romanian: Aromâni, Greek: Kutsóvlachi), which are further divided into sub-groups. Pindeans, concentrated in and around the Pindus Mountains of Northern and Central Greece. Gramustians (or Gramosteans, gr. grammostianoi), from Gramos Mountains, an isolated area in south-eastern Albania, and north-west of Greece. Muzachiars, from Muzachia situated in southwestern-central Albania. Farsherots (or Farsheriots), concentrated in Epirus, from Frashër (Aromanian Farshar), once Aromanian urban center situated in south-eastern Albania. Moscopolitans, from the city of Moscopole, once an important urban center of the Balkans, now a village in southeastern Albania. The Aromanian communities have several nicknames depending on the country where they are living. Gramustians and Pindians are nicknamed Koutsovlachs (Greek: Κουτσόβλαχοι). This term is sometimes taken as derogatory, as the first element of this term is from the Greek koutso- (κουτσό-) meaning "lame". Following a Turkish etymology where küçük means "little" they are the smaller group of Vlachs as opposed to the more numerous Vlachs (Daco-Romanians). Farsherots, from Frashër (Albania), Moscopole and Muzachia are nicknamed "Frashariotes" or Arvanitovlachs (Greek Αρβανιτοβλαχοι), meaning "Albanian Vlachs" referring to their place of origin. Most of the Frashariotes are characterized also as "Greek-Vlach Northern Epirotes" because of their frequent historical inhabitancy of ethnic Greek territory. In the South Slavic countries, such as Serbia, North Macedonia and Bulgaria, the nicknames used to refer to the Aromanians are usually Vlasi (South Slavic for Vlachs and Wallachians) and Tsintsari (also spelled Tzintzari, Cincari or similar), which is derived from the way the Aromanians pronounce the word meaning five, tsintsi. In Romania, the demonym macedoni and machedoni is also used. In Albania, the terms Vllah ("Vlach") and Çoban or Çobenj (from Turkish çoban, "shepherd") are used. The Aromanian community in Albania is estimated to number 100,000 to 200,000 people, including those who no longer speak the language. Tanner estimates that the community constitutes 2% of the population. In Albania, Aromanian communities inhabit Moscopole, their most famous settlement, the Kolonjë District (where they are concentrated), a quarter of Fier (Aromanian Ferãcã), while Aromanian was taught, as recorded by Tom Winnifrith, at primary schools in Andon Poçi near Gjirokastër (Aromanian Ljurocastru), Shkallë (Aromanian Scarã) near Sarandë, and Borovë near Korçë (Aromanian Curceau) (1987). A Romanian research team concluded in the 1960s that Albanian Aromanians migrated to Tirana, Stan Karbunarë, Skrapar, Pojan, Bilisht and Korçë, and that they inhabited Karaja, Lushnjë, Moscopole, Drenovë and Boboshticë (Aromanian Bubushtitsa). The Aromanians are predominantly Orthodox Christians, and follow the Eastern Orthodox liturgical calendar. Map of the Roman Empire during its height, under Trajan (r. 98–117). The Aromanian language is related to the Vulgar Latin spoken in the Balkans during the Roman period. It is hard to establish the history of the Vlachs in the Balkans, with a gap between the barbarian invasions and the first mentions of the Vlachs in the 11th and 12th centuries. Byzantine chronicles are unhelpful, and only in the 13th, 14th and 15th centuries the term Vlach becomes more frequent, although it proves problematic to distinguish sorts of Vlachs as it was used for various subjects, such as the empire of the Asen dynasty, Thessaly, and Romania across the Danube. It has been assumed that Aromanians are descendants of Roman soldiers or Latinized original populations (Greeks, Illyrians, Thracians or Dardanians), due to the historical Roman military presence in the territory inhabited by the community. Many Romanian scholars maintain that the Aromanians were part of a Daco-Romanian migration from the north of the Danube between the 6th and 10th centuries, supporting the theory that the 'Great Romanian' population descend from the ancient Dacians and Romans. Greek scholars view the Aromanians as descendants of Roman legionaries that married Greek women. There is no evidence for either theory, and Winnifrith deems them improbable. The little evidence that exists points that the Vlach (Aromanian) homeland was in the southern Balkans and North of the Jireček Line demarcating the Latin and Greek linguistic influence spheres. With the Slavic breakthrough of the Danube frontier in the 7th century, Latin-speakers were pushed further southwards. Aromanian shepherd in traditional clothes, photo from the early 1900s, Archive: Manaki Brothers. The Aromanians or Vlachs first appear in medieval Byzantine sources in the 11th century, in the Strategikon of Kekaumenos and Anna Komnene's Alexiad, in the area of Thessaly. In the 12th century, the Jewish traveller Benjamin of Tudela records the existence of the district of "Vlachia" near Halmyros in eastern Thessaly, while the Byzantine historian Niketas Choniates places "Great Vlachia" near Meteora. Thessalian Vlachia was apparently also known as "Vlachia in Hellas". Later medieval sources also speak of an "Upper Vlachia" in Epirus, and a "Little Vlachia" in Aetolia-Acarnania, but "Great Vlachia" is no longer mentioned after the late 13th century. The medieval Vlachs (Aromanians) of Herzegovina are considered as authors of the famous funerary monuments with petroglyphs (stecci in Serbian) from Herzegovina and surrounding countries. The theory of the Vlach origin was proposed by Bogumil Hrabak (1956) and Marian Wenzel  and more recently was supported by the archeological and anthropological researches of skeleton remains from the graves under stećci. The theory is much older and was first proposed by Arthur Evans in his work Antiquarian Researches in Illyricum (1883). While doing research with Felix von Luschan on stećak graves around Konavle, he found that a large number of skulls were not of Slavic origin but similar to older Illyrian and Arbanasi tribes, as well as noting that Dubrovnik memorials recorded those parts inhabited by the Vlachs until the 15th century. A distinct Aromanian consciousness was not developed until the 19th century, and was influenced by the rise of other national movements in the Balkans. Until then, the Aromanians, as Eastern Orthodox Christians, were subsumed with other ethnic groups into the wider ethnoreligious group of the "Romans" (in Greek Rhomaioi, after the Eastern Roman or Byzantine Empire), which in Ottoman times formed the distinct Rum millet. The Rum millet was headed by the Greek-dominated Patriarchate of Constantinople, and the Greek language was used as a lingua franca among Balkan Orthodox Christians throughout the 17th–19th centuries. As a result, wealthy, urbanized Aromanians were culturally Hellenized and played a major role in the dissemination of Greek language and culture; indeed, the first book written in Aromanian was written in the Greek alphabet and aimed at spreading Greek among Aromanian-speakers. By the early 19th century, however, the distinct Latin-derived nature of the Aromanian language began to be studied in a series of grammars and language booklets. In 1815, the Aromanians of Budapest requested permission to use their language in liturgy, but it was turned down by the local metropolitan. The establishment of a distinct Aromanian national consciousness, however, was hampered by the tendency of the Aromanian upper classes to be absorbed in the dominant surrounding ethnicities, and espouse their respective national causes as their own. So much did they become identified with the host nations that Balkan national historiographies portray the Aromanians as the "best Albanians", "best Greeks" and "best Bulgarians", leading to researchers calling them the "chameleons of the Balkans". Consequently, many Aromanians played a prominent role in the modern history of the Balkan nations: Macedonian revolutionary Pitu Guli, Greek Prime Minister Ioannis Kolettis, Greek magnate Georgios Averoff, Greek Defence Minister Evangelos Averoff, Serbian Prime Minister Vladan Đorđević, Patriarch Athenagoras I of Constantinople, Romanian metropolitan Andrei Şaguna, the Wallachian and Moldavian rulers of the Ghica family, etc. Following the establishment of independent Romania and the autocephaly of the Romanian Orthodox Church in the 1860s, the Aromanians increasingly began to come under the influence of the Romanian national movement. Although vehemently opposed by the Greek church, the Romanians established an extensive state-sponsored cultural and educative network in the southern Balkans: the first Romanian school was established in 1864, and by the early 20th century there were 100 Romanian churches and 106 schools with 4,000 pupils and 300 teachers. As a result, Aromanians divided into two main factions, one pro-Greek, the other pro-Romanian, plus a smaller focusing exclusively on its Aromanian identity. With the support of the Great Powers, and especially Austria-Hungary, the "Aromanian-Romanian movement" culminated in the recognition of the Aromanians as a distinct millet (Ullah millet) by the Ottoman Empire on 23 May 1905, with corresponding freedoms of worship and education in their own language. Nevertheless, due to the advanced assimilation of the Aromanians, this came too late to lead to the creation of a distinct Aromanian national identity; indeed, as Gustav Weigand noted in 1897, most Aromanians were not only indifferent, but actively hostile to their own national movement. At the same time, the Greek–Romanian antagonism over Aromanian loyalties intensified with the armed Macedonian Struggle, leading to the rupture of diplomatic relations between the two countries in 1906. During the Macedonian Struggle, most Aromanians participated on the "patriarchist" (pro-Greek) side, but some sided with the "exarchists" (pro-Bulgarians). However, following the Balkan Wars of 1912–13, Romanian interest waned, and when it revived in the 1920s it was designed more towards encouraging the Romanians' "Macedonian brothers" to emigrate to Southern Dobruja, where there were strong non-Romanian minorities. While Romanian activity declined, from World War I on and with its involvement in Albania, Italy made some efforts—not very successful—in converting pro-Romanian sympathies into pro-Italian ones. In World War II, during the Axis occupation of Greece, Italy encouraged Aromanian nationalists to form an "Aromanian homeland", the so-called Principality of the Pindus. The project never gained much traction among the local population, however. On the contrary, many leading figures of the Greek Resistance against the Axis, like Andreas Tzimas, Stefanos Sarafis, and Alexandros Svolos, were Aromanians. The "principality" project collapsed with the Italian armistice in 1943. The date of the Ottoman irade of 23 May 1905 has been adopted in recent times by Aromanians in Albania, Australia, Bulgaria and the Republic of Macedonia as the "National Day of the Aromanians", but notably not in Greece or among the Aromanians in the Greek diaspora. In modern times, Aromanians generally have adopted the dominant national culture, often with a dual identity as both Aromanian and Greek/Albanian/Bulgarian/Macedonian/Serbian/etc. Aromanians are also found outside the borders of Greece. There are many Aromanians in southern Albania and in towns all over the Balkans, while Aromanians identifying as Romanians are still to be found in areas where Romanian schools were active. There are also many Aromanians who identify themselves as solely Aromanian (even, as in the case of the "Cincars", when they no longer speak the language). 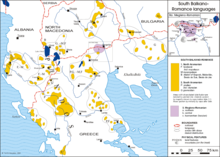 Such groups are to be found in southwestern Albania, the eastern parts of the Republic of Macedonia, the Aromanians who immigrated to Romania in 1940, and in Greece in the Veria (Aromanian Veryea or Veryia) and Grevena (Aromanian Grebini) areas and in Athens. In Greece, Aromanians are not recognised as an ethnic but as a linguistic minority and, like the Arvanites, have been indistinguishable in many respects from other Greeks since the 19th century. Although Greek Aromanians would differentiate themselves from native Greek speakers (Grets) when speaking in Aromanian, most still consider themselves part of the broader Greek nation (Elini, Hellenes), which also encompasses other linguistic minorities such as the Arvanites or the Slavic speakers of Greek Macedonia. Greek Aromanians have long been associated with the Greek national state, actively participated in the Greek Struggle for Independence, and have obtained very important positions in government, although there was an attempt to create an autonomous Aromanian canton under the protection of Italy at the end of World War I, called Principality of the Pindus. Aromanians have been very influential in Greek politics, business and the army. Revolutionaries Rigas Feraios and Giorgakis Olympios, Prime Minister Ioannis Kolettis, billionaires and benefactors Evangelos Zappas and Konstantinos Zappas, businessman and philanthropist George Averoff, Field Marshal and later Prime Minister Alexandros Papagos, and conservative politician Evangelos Averoff were all either Aromanians or of partial Aromanian heritage. It is difficult to estimate the exact number of Aromanians in Greece today. The Treaty of Lausanne of 1923 estimated their number between 150,000 and 200,000, but the last two censuses to differentiate between Christian minority groups, in 1940 and 1951, showed 26,750 and 22,736 Vlachs respectively. Estimates on the number of Aromanians in Greece range between 40,000 and 300,000. Thede Kahl estimates the total number of people with Aromanian origin who still understand the language as no more than 300,000, with the number of fluent speakers under 100,000. Generally, the use of the minority languages has been discouraged in Greece, although recently there have been efforts to preserve the endangered languages (including Aromanian) of Greece. Since 1994, the Aristotle University of Thessaloniki offers beginner and advanced courses in "Koutsovlach", and cultural festivals with over 40,000 participants—the largest Aromanian cultural gatherings in the world—regularly take place in Metsovo. Nevertheless, there are no exclusively Aromanian newspapers, and the Aromanian language is almost totally absent from television. Indeed, although as of 2002 there were over 200 Vlach cultural associations in Greece, many did not even feature the term "Vlach" in their titles, and only a few are active in preserving the Aromanian language. In 1997, the Parliamentary Assembly of the Council of Europe passed a resolution encouraging the Balkan states to take steps to rectify the "critical situation" of Aromanian culture and language. In response, the then President of Greece, Konstantinos Stefanopoulos, publicly urged Greek Aromanians to teach the language to their children. However, the largest Aromanian group in Greece (and across the world), the Pan-Hellenic Union of Cultural Associations of Vlachs in Greece, has repeatedly rejected the classification of Aromanian as a minority language or the Vlachs as a distinct ethnic group separate from the Greeks, considering the Aromanians as an "integral part of Hellenism". The Aromanian (Vlach) Cultural Society, which is associated with Sotiris Bletsas, is represented on the Member State Committee of the European Bureau for Lesser Spoken Languages in Greece. There is a large Aromanian community in Albania, which is officially called Vlach Minority (Albanian: Minoriteti Vllah), specifically in the southern and central regions of the country. It is estimated that the number of Aromanians in Albania go up to 200,000, including those not speaking the language any more. [incomplete short citation] There are currently timid attempts to establish education in their native language in the town of Divjakë. For the last years there seems to be a renewal of the former policies of supporting and sponsoring of Romanian schools for Aromanians of Albania. As a recent article in the Romanian media points out, the kindergarten, primary and secondary schools in the Albanian town of Divjakë where the local Albanian Aromanians pupils are taught classes both in Aromanian and Romanian were granted substantial help directly from the Romanian government. The only Aromanian language church in Albania is the Transfiguration of Jesus (Aromanian Ayiu Sotir) of Korçë, which was given 2 billion lei help from the Romanian government. They also have a political party named The Alliance for European Dignity, and two social organisations named Shoqata Arumunët/Vllehtë e Shqiperisë (The Society of the Aromanians/Vlachs of Albania) and Unioni Kombëtar Arumun Shqiptar (The Aromanian Albanian National Union). Many of the Albanian Aromanians (Arvanito Vlachs) have immigrated to Greece, since they are considered in Greece part of the Greek minority in Albania. Notable Aromanians whose family background hailed from today's Albania include Bishop Andrei Şaguna, and Reverend Llambro Ballamaci, whereas notable Albanians with an Aromanian family background are actors Aleksandër (Sandër) Prosi, Margarita Xhepa, Albert Vërria, and Prokop Mima, as well as composer Nikolla Zoraqi and singers Eli Fara and Parashqevi Simaku. On 13 October 2017, Aromanians received the official status of ethnic minority, through voting of a bill by Albanian Parliament. According to official government figures (census 2002), there are 9,695 Aromanians or Vlachs, as they are officially called in Macedonia. According to the census of 1953 there were 8,669 Vlachs, 6,392 in 1981 and 8,467 in 1994. Aromanians are recognized as an ethnic minority, and are hence represented in Parliament and enjoy ethnic, cultural, linguistic and religious rights and the right to education in their language. Gheorghe (Ioryi) Mucitani, leader of the first Aromanian band in IMRO. They have also received financial support from the Romanian government, which made recognition of the Republic of Macedonia's independence conditional on the extension of minority rights to the Aromanians. There are Aromanian cultural societies and associations such as the Union for Aromanian Culture from the Republic of Macedonia, The Aromanian League of the Republic of Macedonia, The International League of Aromanians, Comuna Armãneascã "Frats Manachi", (The Aromanian Community Manaki Brothers) in Bitola (Aromanian Bituli or Bitule)), Partia a'Armãnjlor di tu Machedonia (The Party of the Aromanians from the Republic of Macedonia) and Unia Democraticã'a Armãnjlor di tu Machedonia (The Democratic Union of the Aromanians from the Republic of Macedonia). Many forms of Aromanian-language media have been established since the 1990s. The Macedonian Government provides financial assistance to Aromanian-language newspapers and radio stations. Aromanian-language newspapers such as Phoenix (Aromanian Fenix) service the Aromanian community. The Aromanian television program Spark (Aromanian Scanteao, Macedonian Искра (Iskra)) broadcasts on the second channel of the Macedonian Radio-Television. There are Aromanian classes provided in primary schools and the state funds some Aromanian published works (magazines and books) as well as works that cover Aromanian culture, language and history. The latter is mostly done by the first Aromanian Scientific Society, "Constantin Belemace" in Skopje (Aromanian Scopia), which has organized symposiums on Aromanian history and has published papers from them. According to the last census, there were 9,596 Aromanians (0.48% of the total population). There are concentrations in Kruševo (Aromanian Crushuva) 1,020 (20%), Štip (Aromanian Shtip) 2,074 (4.3%), Bitola 1,270 (1.3%), Struga 656 (1%), Sveti Nikole (Aromanian San Nicole) 238 (1.4%), Kisela Voda 647 (1.1%) and Skopje 2,557 (0.5%). Since the Middle Ages, due to the Turkish occupation and the destruction of their cities, such as Moscopole, Gramoshtea, Linotopi and later on Kruševo, many Aromanians fled their native homelands in the Balkans to settle the Romanian principalities of Wallachia and Moldavia, which had a similar language and a certain degree of autonomy from the Turks. These immigrant Aromanians were more or less assimilated into the Romanian population. In 1925, 47 years after Dobruja was incorporated into Romania, King Ferdinand gave the Aromanians land and privileges to settle in this region, which resulted in a significant migration of Aromanians into Romania. Today, 25% of the population of the region are descendants of Aromanian immigrants. There are currently between 50,000 and 100,000 Aromanians in Romania, most of which are concentrated in Dobruja. According to the Union for Aromanian Language and Culture there are some 100,000 Aromanians in Romania, and they are often called Makidon. Some Aromanian associations even place the total number of people of Aromanian descent in Romania as high as 250,000. Recently, there has been a growing movement in Romania, both by Aromanians and by Romanian lawmakers, to recognize the Aromanians either as a separate cultural group or as a separate ethnic group, and extend to them the rights of other minorities in Romania, such as mother-tongue education and representatives in parliament. Most of the Aromanians in the Sofia region are descendants of Macedonian and northern Greek emigrants who arrived between 1850 and 1914. In Bulgaria most Aromanians were concentrated in the region south-west of Sofia, in the region called Pirin, formerly part of the Ottoman Empire until 1913. Due to this reason, a large number of these Aromanians moved to Southern Dobruja, part of the Kingdom of Romania after the Treaty of Bucharest of 1913. After the reinclusion of Southern Dobruja in Bulgaria with the Treaty of Craiova of 1940, most moved to Northern Dobruja. Another group moved to northern Greece. Nowadays, the largest group of Aromanians in Bulgaria is found in the southern mountainous area, around Peshtera. Most Aromanians in Bulgaria originate from Gramos Mountains, with some from Macedonia, Pindus Mountains and Moscopole. According to the 1926 official census, there were: 69,080 Romanians, 5,324 Aromanians, 3,777 Cutzovlachs, and 1,551 Tsintsars. In medieval times, the Aromanians populated Herzegovina and elevated famous necropolises with petroglyphs (Radimlja, Blidinje, etc). The Aromanians, known as Cincari (Цинцари), migrated to Serbia in the 18th and early 19th centuries. They most often were bilingual in Greek, and were often called "Greeks" (Grci). They were influential in the forming of Serbian statehood, having contributed with rebel fighters, merchants, and educated people. Many Greek-Aromanians (Грко-Цинцари) came to Serbia with Alija Gušanac as krdžalije (mercenaries) and did later join the Serbian Revolution (1804–17). Some of the notable rebels include Konda Bimbaša and Papazogli. Among the notable people of Aromanian descent are playwright Jovan Sterija Popović (1806–1856), novelist Branislav Nušić (1864–1938), and politician Vladan Đorđević (1844–1930). The majority of Serbian people of Aromanian descent do not speak Aromanian and espouse a Serb identity. They live in Niš, Belgrade and some smaller communities in Southern Serbia, such as Knjaževac. An Aromanian association named "Lunjina" was founded in Belgrade in 1991. According to the 2011 census, there were 243 Serbian citizens that identified as ethnic Cincari. It is estimated that there are 15,000 people of Aromanian descent in Serbia. Aside from the Balkan countries, there are also communities of Aromanian emigrants living in Canada, the United States, France and Germany. Although the largest diaspora community is in select major Canadian cities, Freiburg, Germany has one of the most important Aromanian organisations, the Union for Culture and Language of the Aromanians, and one of the largest libraries in the Aromanian language. In the United States, The Society Fãrshãrotul is one of the oldest and most-known associations of Aromanians, founded in 1903 by Nicolae Cican, an Aromanian native of Albania. In France, the Aromanians are grouped in the Trã Armãnami cultural association. In 2006 Bosch et al. attempted to determine if the Aromanians are descendants of Latinised Dacians, Greeks, Illyrians, Thracians or a combination of these, but no hypothesis could be proven because of the underlying genetic similarity of all the tested Balkan groups. Linguistic and cultural differences between Balkan groups were deemed too weak to prevent gene flow among the groups. Haplogroup R1b is the most common haplogroup among two or three of the five tested Aromanian populations, which is not shown as a leading mark of the Y-DNA locus in other regions or ethnic groups on the Balkan Peninsula. On the 16 Y-STR markers from the five Aromanian populations, Jim Cullen's predictor speculates that over half of the mean frequency of 22% R1b of the Aromanian populations is more likely to belong to the L11 branch.> L11 subclades form the majority of Haplogroup R1b in Italy and western Europe, while the eastern subclades of R1b are prevailing in populations of the eastern Balkans. ^ Puig, Lluis Maria de (17 January 1997). "Report: Aromanians". Council of Europe Parliamentary Assembly. Doc. 7728. ^ "Albanian census 2011" (PDF). Archived from the original (PDF) on 14 November 2014. Retrieved 9 August 2014. ^ Joshua Project. "Country - Romania". Joshua Project. Retrieved 9 August 2014. ^ a b "North Macedonia census 2002" (PDF). Retrieved 9 August 2014. ^ "2011 Bulgaria Census". Censusresults.nsi.bg. 2011. Retrieved 9 August 2014. ^ "1. POPULATION BY ETHNICITY – DETAILED CLASSIFICATION, 2011 CENSUS". Retrieved 19 February 2018. ^ "1. Stanovništvo prema etničkoj/nacionalnoj pripadnosti - detaljna klasifikacija". Retrieved 21 February 2018. ^ a b c Kahl 2002, p. 145. ^ "Vlach - European ethnic group". Britannica.com. Retrieved 9 January 2018. ^ James Minahan (1 January 2002). Encyclopedia of the Stateless Nations: A-C. Greenwood Publishing Group. pp. 175–. ISBN 978-0-313-32109-2. Retrieved 18 April 2012. ^ "Magyar Néprajzi Lexikon /". Mek.niif.hu. Retrieved 9 January 2018. ^ a b c Winnifrith 1987, p. 35. ^ Katsanis N.A. & Dinas K.D. The Vlachs of Greece. Ch. 6. The names of the Vlachs. In Greek language: "Στην Αλβανία υπάρχουν οι Φρασαριώτες Βλάχοι (από την περιοχή Φράσαρι) γνωστοί και ως Αρβανιτόβλαχοι, οι περισσότεροι από τους οποίους είναι Ελληνόβλαχοι βορειοηπειρώτες που κατά καιρούς, λόγω των ιστορικών συνθηκών, εγκαθίστανται στον ελληνικό χώρο." N.A. Katsanis is Associate Professor of Philology at the University of Thessalonike. K.D. Dinas is Associate Professor of Linguistics at the Univ. of West Macedonia, Greece. ^ Tanner 2004, pp. 203–. ^ a b Tanner 2004, p. 209. ^ a b Tanner 2004, p. 210. ^ a b Winnifrith 1987, p. 39. ^ a b c Winnifrith 2002, p. 114. ^ Tanner 2004, p. 205. ^ a b Winnifrith 2002, p. 115. ^ a b Marian Wenzel, Bosnian and Herzegovinian Tombstobes-Who Made Them and Why?" Sudost-Forschungen 21(1962): 102-143. ^ a b ODB, "Vlachs" (A. Kazhdan), pp. 2183–2184. ^ ODB, "Vlachia" (A. Kazhdan), p. 2183. ^ a b Kahl 2002, p. 146. ^ Kahl 2002, pp. 146–147. ^ a b Kahl 2002, p. 147. ^ Kahl 2002, pp. 149–150. ^ Kahl 2002, p. 150. ^ Kahl 2002, pp. 147–148. ^ a b Kahl 2002, p. 148. ^ a b c Kahl 2002, p. 149. ^ a b c Kahl 2002, p. 151. ^ a b Kahl 2002, p. 152. ^ a b c Kahl 2002, p. 153. ^ Leontis, Artemis (2009). Culture and customs of Greece. Greenwood Press. p. 13. ^ Merry, Bruce (2004). Encyclopedia of modern Greek literature. Greenwood Publishing Group. p. 163. ^ Brown, James F. (2001). The grooves of change: Eastern Europe at the turn of the millennium. Duke University Press. p. 261. ^ a b c d Kahl 2002, p. 155. ^ "RECOMMENDATION 1333 (1997) on the Aromanian culture and language". 1997. Archived from the original on 18 November 2002. Retrieved 21 February 2015. ^ Έκδοση ψηφίσματος διαμαρτυρίας κατά του Στέτ Ντιπαρτμεντ (in Greek). 28 February 2001. Archived from the original on 15 September 2004. Retrieved 21 February 2015. ^ Έκδοση Δελτίου Τύπου για την διοργάνωση του Συνεδρίου του Ελληνικού παραρτήματος της μη κυβερνητικής οργάνωσης του Ε.Β.L.U.L., στη Θεσσαλονίκη (in Greek). 14 November 2002. Archived from the original on 10 September 2004. Retrieved 21 February 2015. ^ Έκδοση ψηφίσματος διαμαρτυρίας κατά της έκθεσης της Αμερικανικής οργάνωσης Freedom House (in Greek). 18 August 2003. Archived from the original on 15 September 2004. Retrieved 21 February 2015. ^ "Aromanians in Albania" (PDF). Ecmi.de. Archived from the original (PDF) on 18 February 2015. Retrieved 2014-08-09. ^ Stephanie Schwandner-Sievers. The Albanian Aromanians´ Awakening: Identity Politics and Conflicts in Post-Communist Albania Archived 18 February 2015 at the Wayback Machine, p. 12-13. ^ The Vlachs of Macedonia Archived 27 October 2010 at the Wayback Machine, Tom J. Winnifrith. ^ Conseil de l'Europe. Assemblée parlementaire. Session ordinaire (1997). Documents de séance. Council of Europe. p. xxi. ISBN 978-92-871-3239-0. ^ Армъните в България ("The Aromanians in Bulgaria") (in Bulgarian). Архитектурно-етнографски комплекс "Етър" - Габрово. Archived from the original on 30 January 2009. Retrieved 15 January 2009. ^ "Ministerul Afacerilor Externe". MAE.ro. 23 July 2014. Retrieved 9 August 2014. ^ "Romanian Global News - singura agentie de presa a romanilor de pretutindeni". 7 October 2007. Archived from the original on 7 October 2007. Retrieved 9 January 2018. ^ "„Остали" етничке заједнице са мање од 2000 припадника и двојако изјашњени" (PDF). RZS. 2012 . ^ a b c d e f g h Bosch, E.; Calafell, F.; González-Neira, A.; Flaiz, C; Mateu, E; Scheil, HG; Huckenbeck, W; Efremovska, L; et al. (2006). "Paternal and maternal lineages in the Balkans show a homogeneous landscape over linguistic barriers, except for the isolated Aromuns". Annals of Human Genetics. 70 (Pt 4): 459–87. doi:10.1111/j.1469-1809.2005.00251.x. PMID 16759179. ^ Myres, Natalie M. (2010). "A major Y-chromosome haplogroup R1b Holocene era founder effect in Central and Western Europe". European Journal of Human Genetics. pp. 95–101. doi:10.1038/ejhg.2010.146. Atanassova, Katya (1998). "Aromanians". Communities and identities in Bulgaria: 1000–1012. Cozaru, G. C., A. C. Papari, and M. L. Sandu. "Considerations Regarding the Ethno-Cultural Identity of the Aromanians in Dobrogea." Tradition and Reform Social Reconstruction of Europe (2013): 121. Iosif, Corina (2011). "The Aromanians between nationality and ethnicity: the history of an identity building". Transylvanian Review. 20: 133–148. Kahl, Thede (2002). "The Ethnicity of Aromanians after 1990: the Identity of a Minority that Behaves like a Majority". Ethnologia Balkanica. 6. pp. 145–169. Kahl, Thede (2003). "Aromanians in Greece. Minority or Vlach-Speaking Greeks". Jahrbücher für Geschichte und Kultur Südosteuropas. 5: 205–219. Motta, Giuseppe (2011). "The Fight for Balkan Latinity. The Aromanians until World War I". Mediterranean Journal of Social Sciences. 2 (3): 252–260. Motta, Giuseppe (2012). "The Fight for Balkan Latinity (II). The Aromanians after World War". Mediterranean Journal of Social Sciences. 3 (11): 541–550. Nowicka, E. (2016). "Ethnic Identity of Aromanians/Vlachs in the 21st Century". Ruzica, Miroslav (2006). "The Balkan Vlachs/Aromanians Awakening, National Policies, Assimilation" (PDF). Proceedings of the Globalization, Nationalism and Ethnic Conflicts in the Balkans and its Regional Context. Belgrade. Schwandner-Sievers, Stephanie (1999). "The Albanian Aromanians' awakening: identity politics and conflicts in post-communist Albania". Flensburg: European Centre for Minority Issues. Tanner, Arno (2004). "The Vlachs - A contested identity". The Forgotten Minorities of Eastern Europe: The History and Today of Selected Ethnic Groups in Five Countries. East-West Books. pp. 203–. ISBN 978-952-91-6808-8. Ţîrcomnicu, Emil (2009). "Some Topics of the Traditional Wedding Customs of the Macedo–Romanians (Aromanians and Megleno–Romanians)". Romanian Journal of Population Studies Supplement: 141–152. Winnifrith, Tom (1987). The Vlachs: the history of a Balkan people (PDF). Duckworth. ISBN 978-0-7156-2135-6. Winnifrith, Tom (2002). Clogg, Richard (ed.). Vlachs. Minorities in Greece: Aspects of a Plural Society. C. Hurst & Co. Publishers. pp. 112–121. ISBN 978-1-85065-705-7. "Report: The Vlachs". Greek Monitor of Human & Minority Rights. December 1995 [May–June 1994]. Wikimedia Commons has media related to Aromanians. Λαογραφικός Σύλλογος Βλάχων Βέροιας (Laografikós Síllogos Vláchon Véroias) (in Greek). Σύλλογος Βλάχων Προσοτσάνης (Síllogos Vláchon Prosotsánis) (in Greek). Λαογραφικός Σύλλογος Βλάχον Επαρχίας Αλμυρού (Laografikós Síllogos Vláchon Eparhías Almyroú) (in Greek). Σύλλογος Βλάχον Ν.Σερρών (Síllogos Vláchon N.Serrón) (in Greek). "Studies on the Vlachs" (in Greek). "Societatea Culturală Aromână" (in Romanian). Archived from the original on 25 April 2017. Retrieved 28 November 2018. "Bana Armănească" (in Aromanian). Archived from the original on 23 January 2002. "Srpsko-Cincarsko Društvo "Lunjina"" (in Serbian and English). "The Society Farsarotul". Archived from the original on 7 December 2004. "Union der Mazedoromanen aus Deutschland E.V." (in German). Bλαχόφωνοι Έλληνες (Vlachófonoi Élliines) (in Greek). Совет на Млади Власи од Македонија "Кристина Костова - Џога" (Sovet na Mladi Vlasi od Makedonija "Kristina Kostova - Gioga") (in Macedonian).